Published by Meanjin (blog), 4 April 2012. Original post. 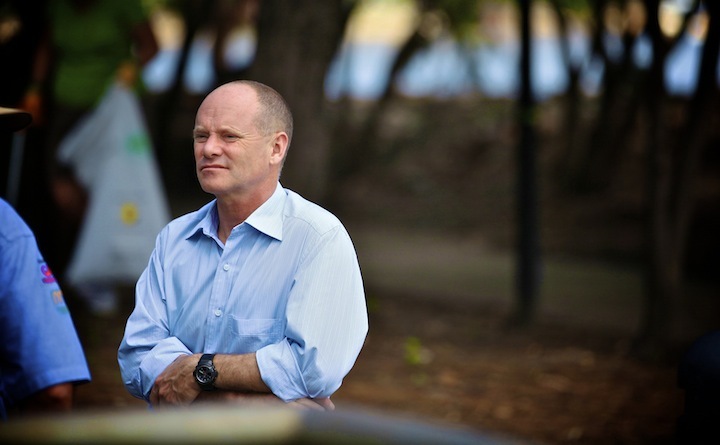 Campbell Newman by Dale Napier (Creative Commons). They don’t call him ‘Can-Do’ Newman without reason. Yesterday afternoon, a mere ten days after his landslide win in the recent state election, Queensland Premier Campbell Newman announced that his department would scrap the Queensland Premier’s Literary Awards. The program, which had run for thirteen years from 1999 to 2011, would be discontinued in order to save $244,475 and sundry operational costs. The swiftness and severity of the move was stunning, but the substance of the decision is by no means surprising. Newman and the Liberal National Party ran on a platform of fiscal prudence, eliminating government waste, and easing cost-of-living pressures on ‘ordinary Queenslanders’. His campaign quite explicitly focused on the concerns of middle-class, white, heterosexual Queenslanders over and above ‘special interest groups’. In such a climate, swingeing cuts to arts programs are to be expected. But nobody expected Newman to make such a dramatic gesture as entirely eliminating one of Queensland’s highest-profile arts programs. In so doing, Queensland has now become the only Australian state without a Premier’s Literary Award or its equivalent. The Premier’s Literary Award may have been first arts program on the chopping block in order to settle an old score. Last year, the then-LNP arts spokesperson Scott Emerson publicly questioned the merit of the awards after David Hicks’ memoir Guantanamo: My Journey was shortlisted for the non-fiction prize. Then-Premier Anna Bligh responded by vigorously defending the awards and suggesting that Emerson was “reducing himself to a book burner”. That the awards were instituted by Bligh’s political mentor, Peter Beattie, can’t have helped their standing within the LNP, either. The awards have been tainted by their association with Labor; for Newman to cut them now sends a strong message that future arts policy in Queensland will not respect old arrangements. In many ways this is a mess of Labor’s own making. Newman’s ability to unilaterally excise this program stems from two factors: that Queensland has only one house of parliament, and that it uses optional preferential voting (OPV). Queensland’s upper house, the Legislative Council, was abolished in 1922 under Labor’s Edward Theodore, leaving Queensland as the sole Australian state with a unicameral parliament. The current system of OPV, in which an elector does not have to number all of their preferences, was introduced by Labor under Wayne Goss. Each of these Labor-lead reforms has given Newman more power than his counterparts in other states. The OPV system and the practice of ‘plumping’ magnified the swing against Labor, so that despite the fact that the LNP received slightly less than fifty per cent of the primary vote it won a whopping eight-six per cent of the seats in the Legislative Assembly. And in the absence of the Legislative Council, the work of legislative oversight is conducted by parliamentary committees, which require at least 30 members of parliament to be in opposition to be fully representative. A combination of these two quirks of Queensland’s political system has delivered Newman unprecedented executive power. As Anne Summers noted yesterday, Newman is not alone in wanting to overhaul his state’s Premier’s Literary Awards—New South Wales Premier Barry O’Farrell announced a comprehensive review of his state’s awards at the end of last year, and they currently appear to be in limbo. But New South Wales’s bicameral system and the remnants of the Labor party there would have made a move such as Newman’s vastly more difficult. Queensland’s political structure, by contrast, leaves those who disagree with Newman’s decision with very few avenues to pursue. It’s safe to say, then, that unless Newman has a road to Damascus moment we will not see any Queensland Premier’s Literary Awards for quite a few years, if ever. At this point it’s worth pausing to consider what Australian literature has lost with the abolition of the awards. To glance over a list of previous winners of the marquee prize—the award for fiction—doesn’t convey the uniqueness of the awards: the lists are dominated by what might be politely termed ‘safe bets’ of strong but uncontroversial writers. J. M. Coetzee, perhaps the most garlanded writer currently operating in Australia, has won the fiction award twice (in 2004 for Elizabeth Costello and in 2010 for Summertime), while heavyweights Peter Carey, Helen Garner, Richard Flanagan and Tim Winton are all represented. Queensland’s own authors have been historically underrepresented in this category, with only four winners in the history of the prize (Thea Astley in 2000, Venero Armanno in 2002, Janette Turner Hospital in 2003, and Alexis Wright in 2007) having a close association with the state. Why, then, is the prize so valued by Queenslanders that yesterday’s announcement sent seismic shudders throughout social media? To my mind, the answer is that few other state literary awards are so dedicated to nurturing and encouraging emerging writers. Queensland stood with South Australia as one of only two states to offer an award for an unpublished manuscript with a publication contract built into the prize. Even in this field of two, Queensland’s award stood out because it was more established (first awarded in 1999 as opposed to 2002) and the winning manuscripts were published by a house with a long history of incubating Australian literary talent (the University of Queensland Press). Although founded in 1988 by UQP, the David Unaipon Award for an unpublished manuscript by an Indigenous writer has been a part of the Queensland Premier’s Literary Awards since 2004—making Queensland the only state with an award specifically for Indigenous writing. These two awards together have launched a large number of literary careers: those of Nike Sulway (then writing under the name n. a. bourke), Nerida Newton, Kimberley Starr, Patrick Holland, Tara June Winch, and Karen Foxlee. Shortlisted competitors have used that fact as a springboard to publication: most famously Alasdair Duncan, whose novel Sushi Central was shortlisted for the award in 2002, but also more recently Nikki McWatters with her memoir One Way or Another: the Story of a Girl Who Loved Rock Stars. It is entirely possible to argue that the cream always rises and that literary talent will win through without awards such as these, but to do so would be to ignore the difficulties of getting a manuscript published in a field where slush piles are becoming an anachronism and an aspiring author often needs an agent and a manuscript appraisal before a publisher will even consider looking at their manuscript. And, as Tara June Winch’s reflections on the Unaipon Award in the Griffith Review demonstrate, awards such as these offer encouragement to talented writers who may not yet have the confidence to peddle their wares in the open marketplace of unsolicited submissions. It’s hard to put a fiscal value on these benefits, but given that the breadth of Queensland’s awards was unparalleled amongst state literary awards—it gave prizes across fourteen separate categories compared to NSW’s thirteen, Western Australia’s ten, South Australia’s eight, Victoria’s seven, and Tasmania’s three—it seems to have performed very well for a minimal investment. $244,475 is a strikingly small amount in a state budget that runs to $4.6 billion deficit. The cost in terms of Queensland’s cultural reputation is impossible to calculate, yet already inevitable comparisons between Newman and Joh Bjelke-Petersen have been aired. In the meantime, writers are already seeking to rebuild. The Unaipon seems most likely to survive, as it previously existed independently of the other awards. Queensland authors Matt Condon and Krissy Kneen have announced their intention to run independent awards structured along much the same lines as the old awards, albeit without the state’s imprimatur. UQP’s general manager, Greg Bain, has pledged his support for the new awards and reaffirmed UQP’s commitment to publishing the recipients of the Unaipon and Emerging Queensland Writer awards. Just how successful these new awards will be in a hostile political climate and without access to the state’s resources remains to be seen.